Savage’s Stealth Evolution is a long-range shooter’s dream—whether on targets or varmints. 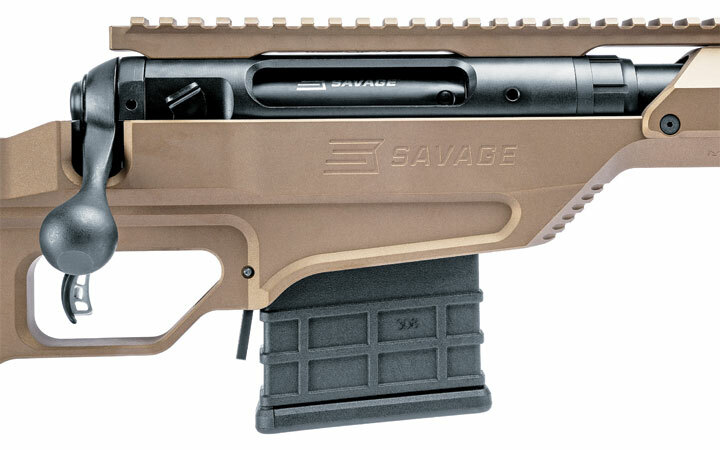 Savage has wasted little time through the years responding to trends in bolt-action centerfire rifles. Back when a long-range shooting sport called F-Class was beginning to take off, Savage was first to mass-produce extremely accurate rifles built specifically for it. Called the Model 12 Precision Target, it has a heavy, 29-inch barrel and weighs close to 13 pounds. If memory serves me correctly, its 6.5-284 and 6mm Norma BR chamberings were firsts among the major manufacturers. A similar rifle with a heavy 30-inch barrel in .308 Win. is built to Palma competition specifications. The new Target Series of rifles also introduced a design idea that originated in benchrest competition. As wind flags respond to a chosen condition, benchrest shooters strive to machine-gun five or 10 shots into a group before the condition leaves. Sending that many bullets downrange in only a few seconds is made difficult by the fact that the turn-bolt actions used in benchrest are single-shots. The heart of the rifle is Savage’s 10/110 action, but what sets it apart is the billet aluminum chassis stock. This model feeds from a single-stack mag and features a paddle release. Different ways have been tried to speed up the loading process, and one that became quite popular was operating the bolt with one hand while feeding cartridges with the other. This was made possible by the addition of a second port on the left-hand side of the receiver, opposite the usual ejection port. Described as “left-load, right-eject,” the idea was adopted by Savage for its target rifles. A right-load, left-eject action made left-handed shooters equally happy. Savage was also one of the first major manufacturers to offer what is commonly referred to today as a chassis rifle. The Model 10 BA Law Enforcement, introduced in 2009, had a Magpul fully adjustable stock, a modified AR-style pistol grip made by Heckler & Koch, and an all-aluminum chassis replete with Picatinny rails. The heavy 24-inch barrel had a muzzle brake and was available in .308 Win, .300 Win. Mag. and .338 Lapua. 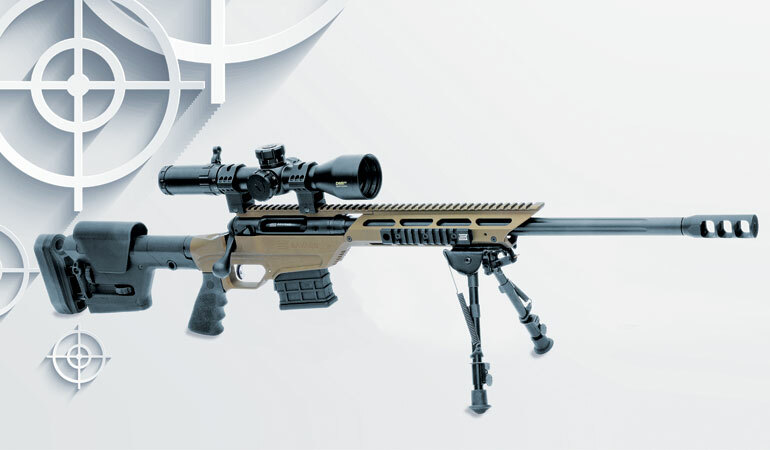 Retail price was $2,400 while the Steyr SSG08, its primary competition at the time, sold for $4,900. 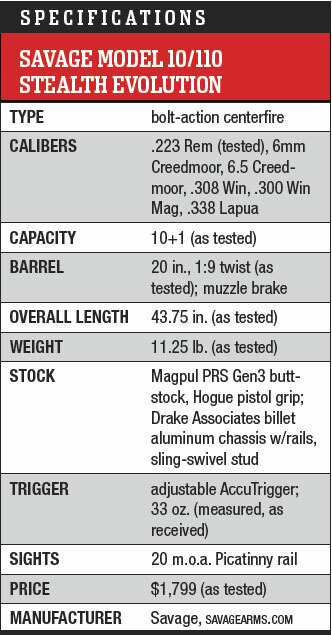 Simpson thinks the Magpul PRS Gen3 stock is the best of the breed. It features well engineered length of pull and comb height adjustments. In 2016, Savage replaced the Model 10 BA with a new Stealth Precision series of Model 10/110 rifles with “10” indicating a short action and “110” a long action. Latest in that series of Savage chassis rifles is the Model 10/110 Stealth Evolution. Calibers are .223 Rem., 6mm Creedmoor, 6.5 Creedmoor, .308 Win, .300 Win. Mag. and .338 Lapua. Left-handed shooters will be thrilled to learn that the Stealth Evolution in all calibers is available with the bolt handle over on their side. Why .223, a cartridge that would seem to be out of place when you’re talking about long range? Consumer requests, said Savage’s Jared Hinton. One of several improvements found in the Stealth Evolution is a Magpul PRS Gen3 stock. I think it is the best available of its type. Machined-aluminum adjustment wheels are easy to operate, and spring-loaded ball detents keep them at the desired settings. Tucked-in positions prevent snagging. Length of pull adjustment range is 141/8 to 15.5 inches. Maximum comb elevation is 3/4 inch, and while that does not sound like much, it proved to be plenty high for a comfortable cheek weld with a Bushnell 3.5-21x50mm DMR IIi Elite Tactical scope resting in high Weaver 34mm tactical rings. A one-inch rubber recoil pad is soft enough to soak up some of the ouch from hard-kicking cartridges, and horizontal surface ribs prevent slipping off the shoulder. Two M-Lok slots at the bottom of the stock are for additional sling mounting, and they also accept a rail for monopod attachment. A 1.25-inch aluminum sling loop attaches to either side of the stock. The chassis’ Picatinny rail is 18 inches long and features 20 m.o.a. of adjustment. Two rail sections and a sling swivel stud provide lots of bipod attachment options. The pistol grip is from Hogue, and the chassis is machined from aluminum billet by Drake Associates. Contouring on its sides along with a bronze Cerakote finish are nice touches. The upper section of the fore-end covering the barrel is attached to the lower section with four screws on each side. Plenty of ventilation slots allow air to circulate around the barrel for cooling. The rear section of an 18-inch-long, 20 m.o.a. Picatinny rail is bolted to the receiver while the front section is integral with the upper section of the fore-end. Shorter rails are attached on both sides of the fore-end with screws. An extra drilled-and-tapped hole allows them to be shifted fore and aft by two inches. After a fun session of banging away at long-distance steel with a Harris bipod attached, I shot the rifle for accuracy with its fore-end nestled in a Brownells Bulls Bag resting stop a Lyman Bag Jack. Easy removal of the two side rails rendered the fore-end sandbag friendly in less than a minute. The polymer-ceramic coating worn by the barreled action is durable and resistant to abrasion, corrosion and hard knocks. The action itself was designed by Nicholas Brewer and introduced by Savage as the Model 110 in 1958. While minor improvements have been made through the years, the basic design has proven to be sound enough to stand the test of time. The Stealth Evolution sports Savage’s three-position sliding tang safety that works for righties and lefties. The rifle offers left-hand bolts in all calibers. Luckily for Savage, design details that were intended to reduce production costs ended up also contributing to exceptional accuracy among mass-produced rifles. One of those is the use of a locknut to secure the barrel in the receiver. Rather than short-chambering a barrel and then achieving proper headspace by gradually deepening the chamber by hand, the chamber of a Savage barrel is reamed full length and the barrel is turned into the receiver until contact is made with a headspace gauge. The barrel is then locked into that position with the big nut. Savage indicates the action of the Stealth Evolution was “blueprinted,” a word long used by gunsmiths who build super-accurate rifles to describe what they do to actions to improve the concentricity of various parts. One of those is lapping the dual-opposed locking lugs to assure both are uniformly contacting their seats in the receiver. Close examination of the lugs on the test rifle with a magnifying glass revealed uniform contact, but the fit appeared to be a result of close-tolerance machining rather than lapping. 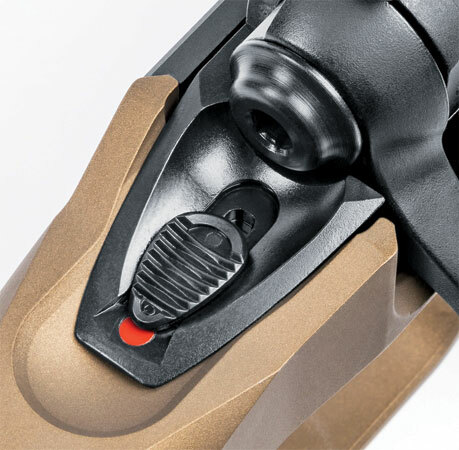 The floating-head design of the Savage bolt also encourages maximum lug engagement during lockup. Heavy in contour, the free-floating barrel has shallow cooling flutes, with the .223 barrel I shot measuring 0.855 inch at the muzzle. Twist rates for the 5R rifling are 1:9 (.223 Rem. ), 1:7.5 (6mm Creedmoor), 1:8 (6.5 Creedmoor), 1:10 (.308 Win.) and 1:9.25 for the .300 Win. Mag. and .338 Lapua. Barrel lengths are 20 inches for the .223 and .308, 24 inches for the 6.5 Creedmoor, .300 Win. Mag. and .338 Lapua and 26 inches for the 6mm Creedmoor. A 1:9 rifling twist for the .223 Rem. is an excellent compromise when bullets within the most popular weight range are used. It will stabilize heavier (longer) bullets than the long-standard 1:12 for that cartridge, and yet it does not impart enough centrifugal force to thin-jacketed 40-grain bullets to cause them to come apart in flight. Savage barrels are button-rifled with chamber to muzzle bore and groove diameter uniformity that rivals some of the more expensive custom barrels. Thorough examination with a Lyman Borecam after just over 200 rounds had been fired revealed almost no copper fouling. Savage wisely chose to go with a .223 Rem. chamber on the Stealth Evolution. Some rifles built today have “5.56mm/223 Rem.” stamped on their barrels, indicating that both of types of ammo can be safely used. However, these chambers are longer than is standard for the .223 Rem., and because many bullets prefer to be seated close to the rifling for best accuracy, magazine length restrictions can prevent that option in a rifle with a true 5.56mm chamber. Barrels of all calibers wear a huge brake of the same basic design as introduced on the Model 110 BA back in 2009. The brake on the .223 Rem. measures 3.1 inches long and 1.05 inches in diameter. An exit hole of 0.275 inch is 0.051 inch larger than bullet diameter. The vertical deflection plates of its three chambers divert propellant gas to both sides with practically none directed either downward or upward. The brake is not actually needed on the .223, but several years ago I shot a Model 110 BA in .338 Lapua, and despite the weight of the gun, its brake was most welcome. In addition to virtually eliminating muzzle rise, it reduced recoil considerably. The perception of recoil will vary considerably from shooter to shooter, but my internal kickometer indicated the Lapua felt about the same as shooting a nine-pound .308 with no brake. To check the brake on the .223 for dust signature, I shot the rifle prone with its muzzle extended beyond the front edge of my shooting mat and while the blast did move some dust and leaves at right angles to the barrel, it was nowhere near as severe as with some brakes I have shot. A friend of mine hunted with a Savage for several years before discovering the tang safety is a three-position. He had a good excuse because the rifle was purchased used and did not come with an owner’s manual. To the rear is Safe with the bolt blocked from rotation, to the front is Fire, and placing the slide between those two positions allows the bolt to be rotated while the safety remains engaged. Mass-produced triggers don’t get any better than the Savage AccuTrigger, and each time I shoot one of the company’s new rifles, I am pleasantly reminded of just how good it really is. The trigger is user-adjustable with a specified pull weight range of 1.5 to six pounds, but since the test rifle departed the factory at 33 ounces with no detectable trace of creep or overtravel, no adjustment was necessary. The 10-round, single-stack detachable magazine is made of a durable synthetic material, and its feed lips present the top cartridge in perfect alignment with the chamber rather than staggered as in an AR-15 magazine. This makes for extremely smooth and reliable feeding. The magazine is easily loaded to its full capacity and just as easily inserted into the rifle. Pushing forward on a long lever located just behind the magazine opening in the receiver disengages the magazine latch. 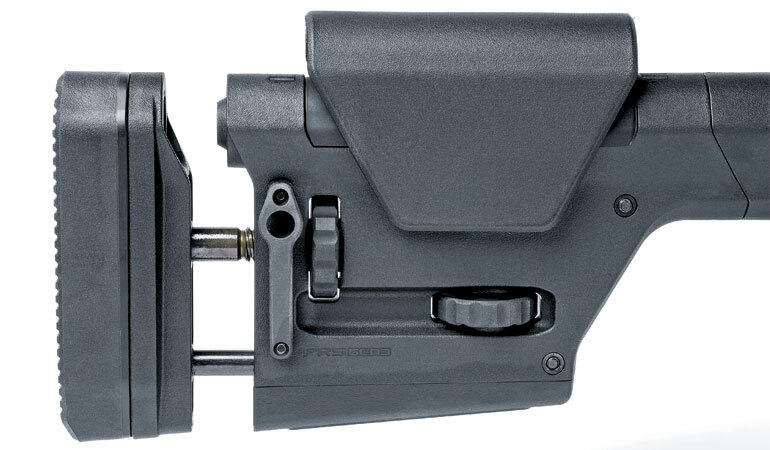 Gravity alone fails to drop an empty magazine when the lever is punched, and I am sure those who use this rifle in Precision Rifle Series and similar competitions will find a way to change that. With an interior length of 2.555 inches, the magazine offers plenty of room for seating out bullets in handloads within close proximity of the rifling. Overall lengths of the factory ammo used for accuracy testing ranged from 2.24 to 2.26 inches with Federal Premium loaded with the 69-grain MatchKing being the longest. The rifle gobbled up all without a single failure to feed. Weights are 10.8 pounds for the .223 and .308, 11 pounds for the 6mm Creedmoor and 6.5 Creedmoor and 11.1 pounds for the .300 Win. Mag. and .338 Lapua. Fresh from its factory carton, the .223 I shot weighed 11 pounds, 2.9 ounces on a digital scale. The Bushnell scope in steel Weaver 34mm Tactical rings increased that to 13 pounds, 11.7 ounces. A Harris bipod and 10 rounds of ammo added another 14.9 ounces. For those who enjoy sitting in one spot and picking off prairie dogs at long range or just punching paper, the Model 10 Stealth Evolution in .223 Rem. is worthy of a serious look.